And will be in Kent very soon! How exciting! We are all very excited about the Olympics here at Sleeping Giant Media. 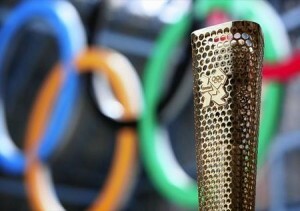 The Olympic Flame is expected to travel for 70 days around an estimated 8,000 miles of the UK, It will pass through 34 towns and villages in Kent from Tuesday, July 17 to Friday, July 20. We will all be there to cheer on our MD Luke Quilter who is carrying the torch on 18th July – and is then getting married in Germany 2 days later! Luke was nominated for his efforts within the local business community and he is a board member for the Kent Foundation for Young Entrepreneurs and winner of the KEiBA young entrepreneur of the year in 2011. Sleeping Giant Media was founded in in 2008 and has continued to grow and we are now a team of 9. Kent will be playing a major role in the 2012 Olympics with a four-day torch relay, the paralympic road cycling events at Brands Hatch and a host of Kent athletes going for gold! Will you be doing anything to celebrate the torch coming through Kent? We will be out in force to cheer on Luke and of course the other Kent torchbearers.